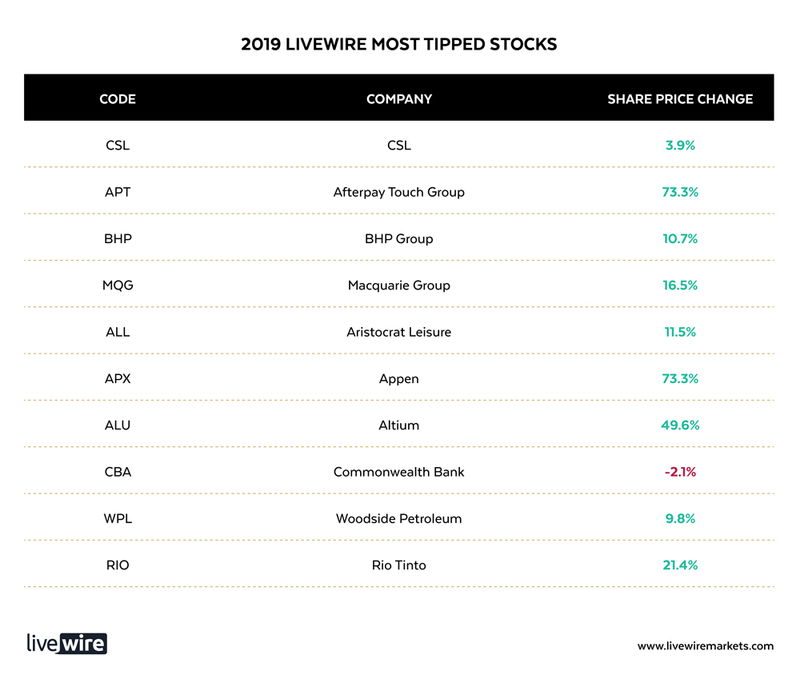 At the start of the year, we announced the ten most tipped stocks from our Livewire reader survey. Three months into the year, this diverse basket is already up by 25.6% on average (or 26.9% with dividends), versus 8.6% for the ASX200. We saw some impressive results from the most tipped stocks in the previous year, so are we starting to see it happen again? To find out, we reached out to ten of our partnering funds to get their view on the outlook for each stock on the list. Read on for exclusive responses from David Poppenbeek, Joe Magyer, James Abela, Dave Allingham, Charlie Aitken, Suhas Nayak, Catherine Allfrey, Warryn Robertson and Emma Goodsell. 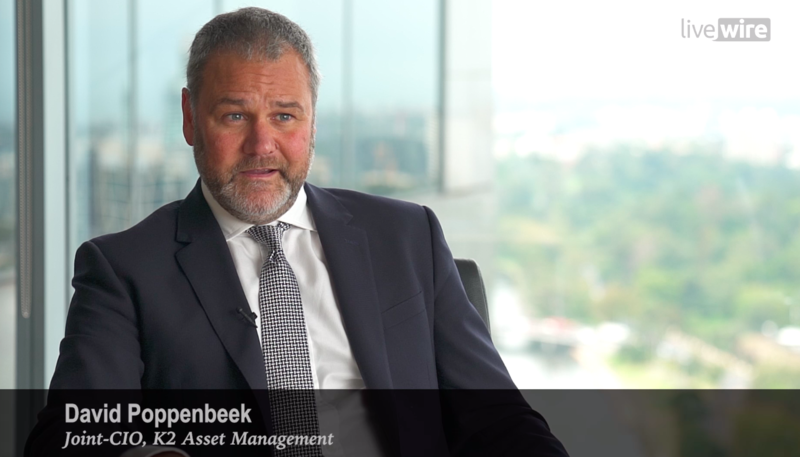 We're conscious Macquarie has done really well over the journey, but when we look at the dividend yield, which is pushing 5%, when we look at the business model which demonstrates best practise, and look at all of the assets that they carry, we're really happy to hold it around the current level of $125. However, we can see a situation where Macquarie could push to an ROE of around 20%. That would be a great outcome and that would deserve a three and a half time book value. So we can see a pathway to Macquarie pushing through $150 in the not too distant future. So we're happy holders. Click the image below, or here to hear David's full thesis on Macquarie. AI-enabling Appen (ASX:APX) has been a rampant ASX success story. Not only are the company’s shares up around 51% since the start of this year, but they have delivered a total return of around 1,300% over the past three years. The company has topped consensus top-line expectations in each of those years and revenue has more than quadrupled thanks heavily to strong and rising demand from a core group of large customers. And I do mean large and heavy, as Appen’s five largest customers made up 89% of the company’s total external revenue in 2018. Few companies are able to scale at such rates or serve such large customers, which speaks well to the market opportunity and Appen’s capabilities. For that matter, the company’s recent Figure Eight acquisition should extend its capabilities even further. The acquisition introduces its own challenges, though, and the financial and operational risk has kicked up a notch as Appen has now done a pair of major acquisitions over the past 17 months. It is also worth remembering that Appen’s large customers are not easily pushed around and have a habit of insourcing services when it suits them. I wouldn’t bet against Appen, because shorting high-growth companies with a history of beating expectations is a hard way to make money. Then again, I also struggle to get enthused about Appen’s shares today. The combination of extreme customer concentration, a net debt position, and a demanding valuation -- the market values Appen at an enterprise value of around 19 times trailing pro-forma gross profit -- makes for a variety of scenarios in which the shares could get hit hard. Ed note: This is an extract from a recent discussion with James that you can access here. To gain conviction to keep holding Altium, there are several key factors to bear in mind. One is the quality of the business overall. So the viability, sustainability, credibility for me is still very, very high. There are not that many companies in my universe that have the strengths, in the viability, sustainability, and credibility. So for me, the VSC scores are really high, so that is unique in itself. Then in an absolute sense, if 50 times goes to 43 times next year, the company is actually growing. What I look at is actually the PE to the ROE ratio, and the ROEs are in the 30s. So actually if I look forward a year only, we're talking 44 to 30 is only around 1.3 times your PE to your ROE. And that's actually not that high. The PE of the market is around 17, and the ROE of the market is around 14. So if you look at Altium in that sense, it doesn't look that high. Then if you look at it relative to the market in terms of what the ROE is of the market, the ROE 30 versus the ROE in the 14s or 15s, it's three times the market, and the PE is about three times the market. So in the context of what it actually is fundamentally, a business which has grown organically and has an ROE of in the 30s. For me it is not a very, very high-risk valuation. There are other businesses in technology that are at high multiples and have low returns, which I have trimmed. And that is a discipline I've learned when that PE to ROE ratio gets above three, it starts to get quite dangerous. If the ROE is pumped up by accounting trickery, or accounting tools that are available such as capitalisation of interest, or deferral of costs, or intangibles amortisation, these are the things that start to increase the risk levels. Altium is an organic business that has ROEs in the 30s, the PE to ROE ratio stands up. And it is fundamentally unique in the universe. I'm still comfortable. But if any of those red flags, or red flags of management start to emerge, then I will absolutely start to trim. Access the full discussion with James by clicking here. CSL has compounded cashflows at a 17% compounded annual growth rate or CAGR over the past 15 years, and is clearly an “earnings compounder”. There are two key risks in investing in a compounder. The first is that the barriers to entry fall (and you miss it). The other is you sell too early. CSL’s core product is IG, a life-saving therapy (c40% of revenue). 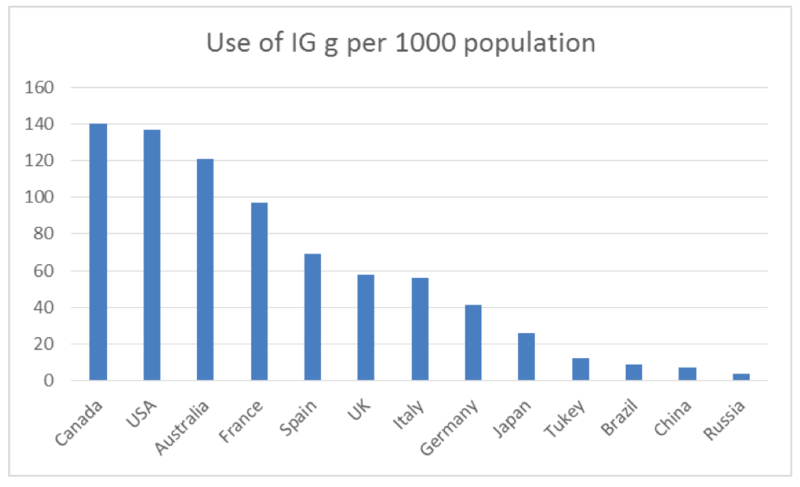 IG is a 30-year-old therapy, demand for which has grown at a 10% CAGR over 30 years, and is still growing at an 8% CAGR. There are not many businesses globally that have enjoyed that kind of demand. Source: MRB, PPTA, Goldman Sachs Research. Projecting demand for any industry can be rubbery. We prefer to focus on supply-side economics. For CSL, these have become more favourable. The plasma industry is under the control of three major players, who generate 85% of the global profit pool. Smaller players barely make any money. 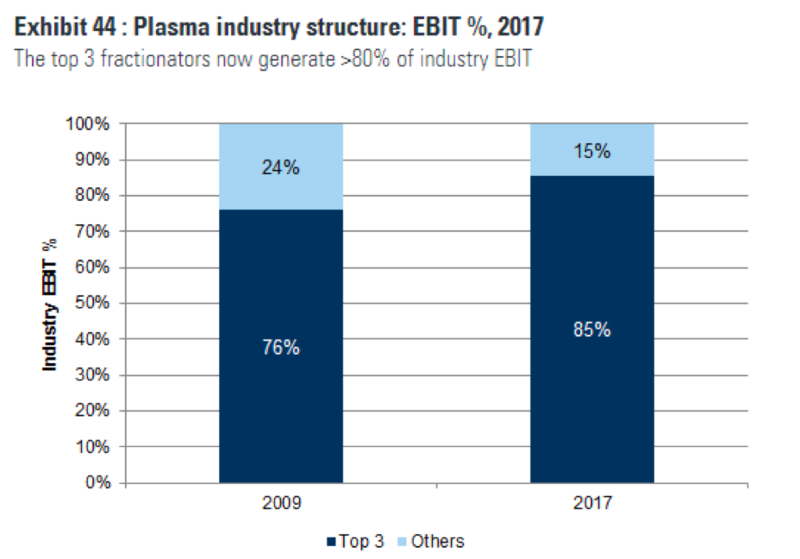 Expanding plasma collection to meet 6% to 8% demand growth rates each year is highly capital intensive. CSL’s major competitors are highly indebted and CSL is rolling out plasma collection centres at two to three times their rate. Collection centre rollout is a two-year leading indicator for market share and volume growth rate, given long lead times for licensing and product approval. High capital requirements and low marginal profitability mean the barriers to entry for plasma are increasing. Indebted competitors and corporate change (CSL’s biggest competitor, Shire, is entering its third set of corporate hands in five years) magnify the opportunity for CSL to gain share against a healthy market demand backdrop. This underpins the long-term investment case in CSL, and we think the bigger risk remains selling too early. Following the Royal Commission, CEO Matt Comyn and Chairperson Catherine Livingstone are on the path to redemption. They are selling assets, paying remediation and getting back to basics on banking i.e. putting the customer first. As a result, we are of the view there is likely to be an off-market buyback pending, primarily from the proceeds from the sale of CFSGAM (funds management arm) for $4.1bn. Beyond this buyback we expect the deteriorating housing and macro environment in Australia caused by the credit restrictions will feed into a negative credit cycle led by unsecured personal lending (auto loans, credit cards). Arrears are rising, provisions will increase driving a higher bad debt expense that will negatively impact profits. A rough rule of thumb being every 1bp increase is equivalent of 0.9% earnings per share. CBA’s last reported bad debt charge was only 13bps and if the cycle extends into commercial property and SME business, we could see a large increase in CBA’s bad debt charge. In times of uncertainty and economic recession, investors generally price bank stocks on price to book rather than PE and yield (as dividends will be cut). 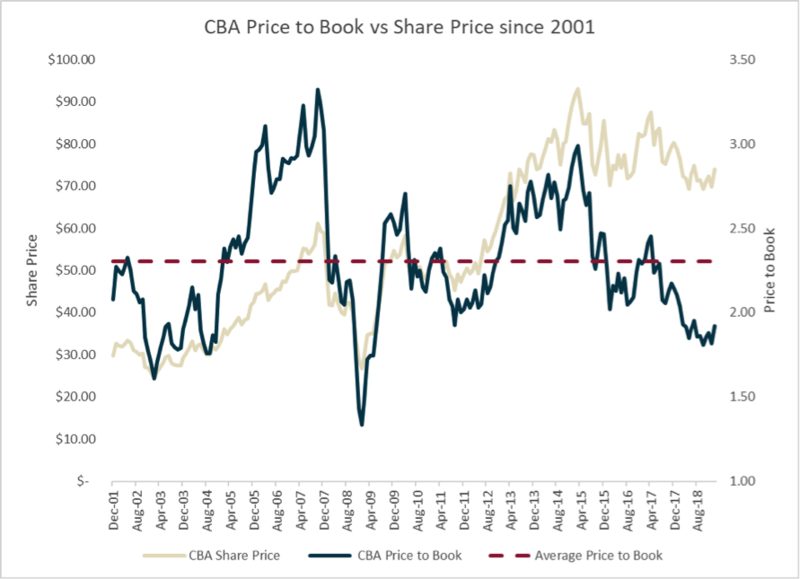 As CBA’s price to book is currently 1.9x, in a recession scenario we would expect the bank would trade at price to book valuation around 1.6x. This is higher than the CBA’s GFC recession low of 1.3x largely because the bank is better provisioned and holds more capital this time so as it stands today, we don’t expect the same fallout. As long-term investors, our focus is on what a company might look like in four or five years, and not just what this year might bring. While we unfortunately owned Woodside before the oil price decline a few years ago, we added more during the downturn. We invested in Woodside because it was low on the cost curve and had long-life, quality reserves to draw upon. In hindsight, we were too early with our call, but in our view the short-term noise did not take away too much of the company’s long-term value. Towards the end of last year the oil price fell sharply again and presented another small opportunity. Despite negative sentiment around oil prices, it’s not all doom and gloom for Woodside in 2019 and beyond. The company’s primary activity is the sale of LNG from three projects in Western Australia. While this year should be a low point in its production profile, two promising large LNG projects (Scarborough and Browse) along with smaller projects in Senegal and Myanmar, suggest that production growth could be strong in the years ahead. Last year, at an average relevant oil price of US$68/barrel the company had earnings of US$1.48 per share and free cash flow excluding its acquisition of Scarborough interests of US$1.95 per share. Woodside’s earnings and free cash flow multiples are therefore lower than the market as a whole, assuming oil prices stay around these levels, while potential growth is arguably better than the average ASX company. The main risks from here are much lower (and sustained) future oil prices, the commercial viability of their projects and Woodside’s ability to execute during what will undoubtedly be an extremely busy period for the company. 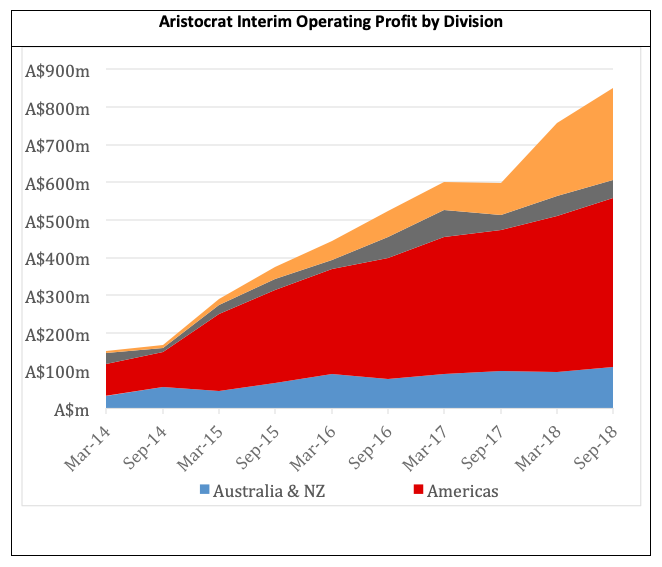 Over the past 5 years Aristocrat has transformed itself from an Australian poker machine producer with a small presence in the American market, to a leading global player in land-based and digital-based gaming. Over these five years the business has achieved exceptionally strong growth across all divisions through a combination of strong organic market share gains and some well-executed strategic acquisitions. Shareholders who have been part of this journey have been thoroughly rewarded with almost a 500% return. But where does that leave us now? 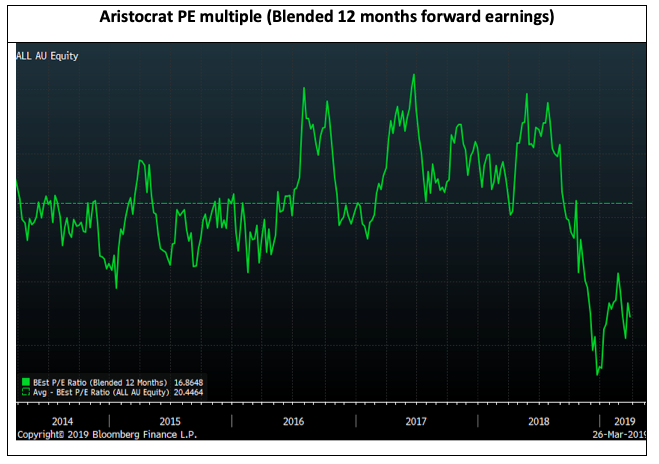 Since mid-2018 Aristocrat has de-rated to its lowest PE multiple in over 5 years. Whilst the land-based businesses continue to grow strongly, the market is grappling with Aristocrat’s expanded push into Social and Digital gaming via two material acquisitions made in the FY18 year. These businesses represent an unknown quantity given there are very few listed peers globally. Aristocrat has a long track record of creating innovative games and building market share across a number of verticals in both land-based and digital games. Aristocrat has a very strong 5 year track record in the digital space. In 2012 ALL paid $20m to acquire Product Madness, as its first foray into the digital space. In FY17 Product Madness delivered earnings of around $160m. The Big Fish and Plarium acquisitions provide Aristocrat greater exposure to a segment of the industry that is growing much faster than traditional land-based segment. The two most relevant mobile categories (social casino and casual games) grew at a 26% and 35% CAGR respectively between 2015 and 2018 (according to App Annie). For context these acquisitions currently represent only around 12% of ALL’s current earnings stream (ie. they haven’t bet the house on it). At current prices you are arguably getting the two new digital businesses for free. There is a lot to like about Rio Tinto’s current strategy, as it seems increasingly clear it is re-shaping its portfolio into less assets but with more options. Its management is ticking a lot of boxes, there are record returns to shareholders, aggressive share buy-backs, a simplified business model and an improving environmental footprint. But as we often say, a great company at the wrong price, can still be a bad investment, so valuation (its share price versus our intrinsic valuation) remains the key metric to assess its merits as an investment in our Australian equity portfolios. On that score, the story is not quite as clear. We currently have Rio Tinto at the current price at about fair value. It is not compelling value in an absolute sense, but in an expensive market, where little is, it still holds some appeal. And, with significant free cash-flows and untapped opportunities in its streamlined operations, it has the capacity to surprise on the upside. As a result, we hold Rio in our Select Australian Equity Fund. We continue to closely monitor the valuation level, compared with other opportunities in the market. Afterpay: What's a billion dollar revenue line worth? The chart below highlights the US is scaling significantly faster than the Australian business did. We think the market is underestimating the implications this has for US GMV. It is undeniable that the product is resonating with US millennials. One million customers have used the service within eleven months of launch and new customers grew at 4-5k per day in the first two months of the year. We think the US business has passed an inflection point, as the Australian business did, where the value of the product to merchants and consumers increases dramatically with user growth. If it plays out like it did in Australia, customer growth could accelerate to 10k a day and beyond. This equates to ~3.5m new customers in the US over the next 12 months, a doubling of APT total customer base. To put it simply, the US is scaling roughly 5x faster than Australia, in a market >10x the size. If we assume APT deliver $25B GMV at ~ 4% merchant fee, then APT will generate $1b of revenue. APT has also guided to a 2% net transaction margin (NTM) on this revenue, implying $500m of NTM. Assuming $150m of corporate overheads would imply 350m profit before tax or NPAT of ~$250m. Given the growth profile, customer unit economics and global growth opportunity that APT will still have at this point, we would expect APT to trade on a PE of 30-40x. This would imply a market capitalisation of $7.5-$10B or $30-40 a share. Ed note: You can access David's full thesis on Afterpay by clicking here. Afterpay delivered one of its most important results in February. It has shown that it can expand overseas while maintaining a lid on bad debts, and a stable overall net-margin. It was able to absorb late fee caps, and invest heavily into establishing the U.S. business. The model looks like it is working. In Australia, Afterpay EBITDA jumped from ~$17m in 1H18 to ~$35.7m in 1H19. This improvement was hidden by investment in the international expansion. Our revised Price Target is $28.02 per share (previously $25.04), with our Buy recommendation remaining unchanged. You can access our full research here. "Thank you for your support, and all the best for a prosperous investing journey through the rest of the year". - and always!